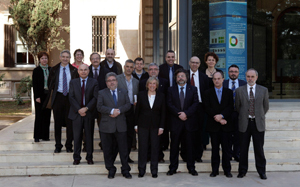 The vice-chancellors of three Catalan universities and representatives of ten biological and biomedical research institutes, together with the Barcelona Supercomputing Center – Centro Nacional de Supercomputación (BSC-CNS) and BioCat, this morning signed an agreement to create Bioinformatics Barcelona (BiB), a platform which it is hoped will turn the Barcelona area into an international point of reference in the field of bioinformatics through cooperation between universities, centres of research, and other public and private entities.This agreement was signed in the presence of the Catalan secretary for universities and research, Antoni Castellà. Bioinformatics is an area of research in which computer science and IT are used to process biological data. The sponsors of the BiB share the view that there is a shortage of experts in this area, which they describe as a “strategic science” in that it “makes sense of the vast volume of biological data” generated. Hence this proposal to boost this area of specialisation, which is “necessary in all areas of the life sciences” and “has a profound impact on fields as diverse as human health, the food industry, the environment, and biotechnology”. Thus, the BiB plans to use the critical mass of internationally renowned researchers in bioinformatics in the Barcelona area to promote high-level postgraduate studies, including the training of new professionals, and to develop scientific and transfer knowledge initiatives that could benefit from this framework for cooperation. Today’s agreement is a commitment between the parties to have the strategic plan that will result in the formal constitution of the initiative finalised within six months. Driven by the desire to draw together talent and resources, the signatories to this document have left the door open to new participants, whether as promoters of the BiB (if they join within the next three months) or as collaborators (if they join after this period). The process of formulating the strategic plan will seek out the participation of all interested scientists and actors in the sector. The formulation of this plan will be led by Ana Ripoll, head of the architecture and computer technology department at the Universitat Autònoma de Barcelona (UAB), who will be its executive chairman. Ferran Sanz, head of biomedical informatics at the UPF, will be its scientific director. Whilst the plan is being formulated, the BiB will be based on the premises of the BSC-CNS.